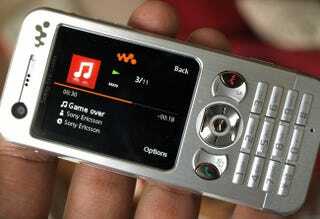 The Gadget: The Sony Ericsson W890i is a slim, Walkman-branded follow-up to the W880i. It offers up Walkman Player 3.0, a 3.2 megapixel camera and Sony's great UI, all in a candybar form factor that doesn't dominate the pocket. While this is currently a Europe-only product, Sony Ericsson phones tend to wash up in the US eventually. The Verdict:: For a non-smartphone, I really like the W890i. I've always been a huge fan of the Sony Ericsson OS and UI on their phones, and that hasn't changed. But what makes this phone so good is that I could see myself using this as a media player if I didn't already have five other dedicated devices lying around. Like the W880i, the W890i has full media playback, a front-side camera for video conferencing, TrackID and other music-related apps. Unlike the W880i, it also has the SensMe music mood mapper, and a higher res camera (3.2 MP vs. 2.0 MP). The Walkman 3.0 interface is well organized and easy to use, video is crisp, and everything is responsive. I really like that the home screen dedicates one of its soft keys to the Walkman player, and there is also a side hard key for the same purpose. It seems minor, but it really makes the media player accessible and eliminates the thinking process. SensMe analyzes the song's tempo and sound to determine its "mood," and then maps out the songs on a graph for you to select accordingly, and the camera takes bright, crisp photos (indoors and outside). The W890i also has the standard array of Bluetooth, games, productivity apps, and a radio to round out the features.